The Capri's construction is incredibly simple, almost to the point of being crude in some areas. But that doesn't stop it being prone to rot, it just makes it easier to fix. Or at least it would if panels were easy to come by, but in many cases they're not. But rust isn't the only enemy of the Capri. Accident damage is a strong possibility, with the newest Capri now 15 years old and probably a string of owners listed on the V5. The 3.0-litre cars were particularly tail-happy but front end damage is the most common result of accident you'll have to contend with. 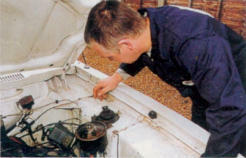 Open the bonnet to inspect the chassis rails to make sure they're undamaged. The most likely area for rust to be lurking is in the front wings, so check for filler in the area around the headlamps and along the edge that meets the front doors. The wings are welded on and original ones are very hard to track down - if you can find one you'll pay up to £300. Repro wings are available for less than £100 each, better-fitting ones costing around £175. McPherson strut Fords are renowned for rot around the strut top mountings, although the Mk III Capri isn't as badly afflicted by this as earlier cars. But it's worth checking anyway and while you're at it take a look at the inner wings, inside edges of the bonnet and the area around the grille. The V6 cars have a triangular strengthening plate on the underside of the inner wing, but they rot so quickly and badly that they are missing on many cars. The A-posts aren't too good at fighting corrosion and the hefty weight of each door (not helped by a pretty generous length) doesn't help to prevent the doors from dropping. Check the fit of each door where it meets the A-post. Any dropping could be down to weakened A-posts or worn hinge pins. The doors themselves also corrode, the worst areas being the bottom edge and the underside - an area that can corrode without being noticed until it's too late. 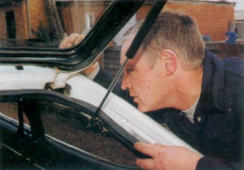 As with most monocoque cars, bodged sills are a common failing so it's important to give them a close inspection. Although Capri floorpans don't normally corrode too badly it's essential to take a good look underneath to make sure there isn't any advanced rot. The most likely area to have corroded is the rear spring hangers. Most of the outer panels are pretty hardy but they're not completely immune to rust. Tailgates corrode along the inner bottom edge and the rear wings sometimes rot just behind the rear wheel arches. 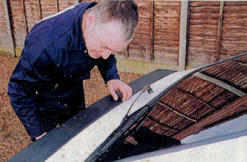 The rear arches themselves are a notorious rot area and are generally far worse underneath than on the surface. Boot floors can also rust and so can the metal around the rear light clusters. Because the 2.8i was fitted with bonded-in tinted glass in its tailgate it's not as easy as you'd think to track down a used hatch. 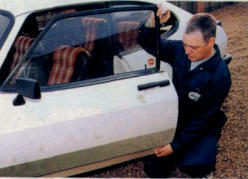 Unless you're careful you could end up with tinted glass all round except in the rear window, as the tailgate from other Mk III's will fit. 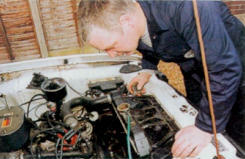 There were four different types of engine fitted to the Mk III Capri. Least desirable and virtually extinct is the Kent unit, used for the 1.3-litre version of the Capri. Next up is the Pinto, offered in 1.6 and 2-litre forms. The 3-litre Essex V6 offers plenty of grunt if little refinement: it was superseded by the 2.8-litre fuel-injected version of the later (Cologne V6). Pinto engines are renowned for their camshaft noise if they haven't had frequent enough oil changes. If you're lucky you'll be able to get away with adjusting the valve clearances but if there's already too much wear you'll have to replace the camshaft along with its followers for around £70. It's not difficult or expensive to put this right, but if you're using the car and don't bother fixing it you'll end up having to splash out on a whole new engine before too long. 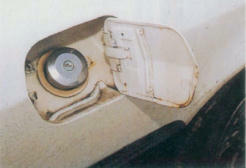 Pinto engines also have an oil spray-bar fitted underneath the cam cover. It's there to lubricate the camshaft and in time it will block up. Replacements are less than a fiver, so if it hasn't had one within the last 30,000 miles you might as well fit a new one. Other than this the Pinto engine is pretty reliable and easily tuneable, but it's worth checking for oil being burned on high-mileage engines (80,000-miles or more). 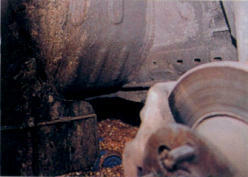 Water pumps also fail quite readily so have a look for leaks - though a replacement pump will only cost around £20. Some four-cylinder cars were fitted with Ford's notoriously bad VV carburettor. Although most VV carbs have been replaced with Weber units by now, if he original is still in place consider the car handicapped. The automatic choke plays up all too readily and leads to both starting and running problems. Unlike Pinto-engined cars, V6 Capris have unstressed engines with plenty of low-down torque. But although they're not likely to have been over-revved, the Essex engines do have one or two weak spots. The oil pump is driven from the distributor by a hexagonal shaft, which sometimes breaks when starting from cold. Unfortunately there's no way of telling if the shaft is weak without dismantling the engine, but if it breaks in use the consequences are serious. Another check that's worth doing is to see if the sump is dented: if the car has been jacked up by its sump the oil pump can sometimes be damaged by the sump coming into contact with it. Another weak point on the Essex V6 is the fibre timing gear, which can break up after high mileages or following overheating. If the car you're looking at has had steel replacements you're lucky, but as they cost around £200 many owners don't fit them. It's also worth doing a compression test, as blown head gaskets and warped cylinder heads aren't unheard of. Look for 120psi per cylinder on a good engine. 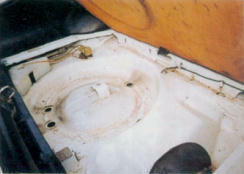 Corrosion in the water jacket is a common Essex ailment, which is why you need to check the condition of the coolant. Each year the system should be flushed through and the coolant replaced (but many owners don't bother). The Cologne unit suffers from the same problems as the Essex, especially silted up water jackets. The injection system is normally reliable, but early problems on these fuel injected cars generally stemmed from the engine's wiring loom. Due to its position under the wheel arch, the fuel pump often corrodes and the casing becomes porous - replacement pumps cost around £85. Four or five-speed manual gearboxes were available on the Mk III Capri, depending on model, and on most versions there was also the option of the Ford C3 three-speed automatic. From 1983 the 2.8i was fitted with a five-speed manual gearbox, but the four-speed units are generally considered to be more reliable and smoother in operation. Whichever gearbox is fitted there's a good chance that second gear will be worn, so listen to see whether it's significantly noisier than any of the other ratios. The bushes wear, leading to a sloppy gear change, and the bearings also wear after 70,000 miles or so, leading to a noisy transmission. If there's significant bearing noise you've got no more than 5000 miles before the gearbox gives up altogether. As if all this isn't enough Capris have a tendency to jump out of gear on the over-run - the cure is to replace or rebuild the gearbox, which will cost up to £150. The Ford-built C3 transmission isn't especially durable, but the key to lengthening its lifespan is regular fluid changes. There aren't that many autos around, with four- cylinder autos especially rare. Replacement gearboxes can be found but are getting very rare, with specialist repair expensive. If there's a vibration coming from the transmission it's probably because the centre bearing in the propshaft has worn. If the bearing isn't replaced (expect to pay around £30) the gearbox rear bearing and the differential nose bearing will be damaged. The diff itself is pretty resilient, but ask whether its oil has been replaced regularly. Every 20,000 miles or two years is ideal. A special lubricant (available from Capri Club International) was specified for the 2.8i Special and 280 Brooklands, which were fitted with an LSD - if normal HP90 oil has been used the LSD will soon pack up. If the model you're looking at should have been fitted with a limited-slip diff, it's easy to check whether or not it's still there. Jack the car up at the back and turn one of the wheels. The wheel on the opposite side should turn the same way - if it turns the opposite way a normal rear axle has been fitted. The steering is pretty reliable so it's just a case of checking for play and making sure the gaiters aren't damaged. The only exception to this is the rubber joint in the flexible steering coupling. If allowed to get soaked in oil it will split, leading to play in the steering. The 2.8i. and 3.0-litre Capris were fitted with power-assisted steering. The front suspension is equally reliable, so it's just a question of making the standard checks for worn dampers by doing a bounce test at each corner. The only other possible fault is that the bushes in the inner track control arm anchorage have broken up, leading to a shudder through the steering as the car goes over bumps. Replacing just the bushes is quite tricky so many owners replace the whole track control arms (TCA) complete at around £35 a pair. But nobody is selling the arms already fitted with polyurethane bushes, which are worth fitting. It the car has been lowered it's worth buying adjustable TCAs to cope with the changes, but at around £200 a pair most owners stick with the standard ones. The rear suspension doesn't give many problems, but if the car is sagging on one side it's because one of the leaf spring has worn and the leaves may even be cracked. 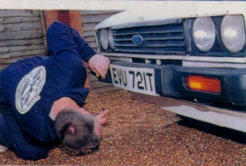 Apart from the 101 Tickfords built, all Capris had a disc/drum braking system. The- set-up does a reasonable job but if a disc has been overworked, warping in the process, there will be juddering from the front as the brakes are applied (although this can also be caused by worn or badly adjusted front wheel bearings). Aftermarket wheels are popular on Capris, many owners fitting later model wheels or Peugeot items, which have the correct offset and PCD. 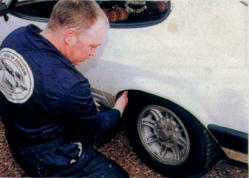 There aren't generally any clearance problems as long as wheels with the correct offset have been used. Non of the different types of trim fitted to the Capri was particularly durable, with the predictable exception of the leather fitted to the 280 Brooklands and the half-leather found in the 2.8 Injection Special. But Ford doesn't supply anything new for the Capri any more so if you're after replacement bits you're going to have to scour autojumbles. The dash top is also a weak point, poor support underneath the centre speaker vent leading to cracks. These are very hard to find, and are starting to fetch premium prices. The fuse box suffers poor connections: if electrical gremlins strike check this first. 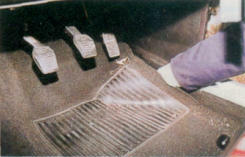 Connection problems also affect the rear wash/wipe because the tailgate contacts corrode. Fine emery paper is normally all that's needed to get it working again. Heater motors often seize if left unused for a period, so keep it active. It the motor seizes try starting the motor on high speed as the extra current has more chance of getting the fan in motion - replacement involves removal of the lower dashboard panels. Cars with fuel injection often suffer from misfiring because of faulty sensors and poor connections in the wiring loom. If you're looking at an automatic car that won't even try to turn over its engine it could be because the inhibitor switch fitted to the nearside of the gearbox has failed. Years ago the Capri was the type of car that you'd have to be very wary of buying because they were invariably thrashed to within an inch of their lives. But the market has changed and most of the cars left are now in the hands of owners who cherish them. But with the Capri being such an easy car to steal, make sure that the example you're looking at really does belong to the person waiting to take your money. It may be crude and unrefined in places, but in 2.8i mode especially the Capri offers a hell of a lot of car for the money.